The MC1400 is the perfect machine to take projects to a whole new level. Create stunning embroidery utilizing 350 Built-in Embroidery designs, 11 Fonts for monogramming, and a 2 & 3 letter mongramming funtion. With a maximum hoop size of 9'.1"x11.8" and embroidery speeds of up to 1,000 spm the MC14000 allows you to complete large projects in no time. It's easy to create and edit designs on the full color LCD touchscreen. Take your embroidery capabilities even further by using the machines Real-Time PC connection to Horizon Link Suite. Quilters and sewists with a creative mindset will enjoy choosing from 400 Built-In stitches and13 one-step buttonholes. The unique Stitch Composer program allows you to create and edit stitches straight from your computer. Free Motion Quilting is easier than ever with the Variable ZigZag option, AcuFeed Flex for precise control, and AcuFil Software for beautifully matched stipling across an entire quilt top! 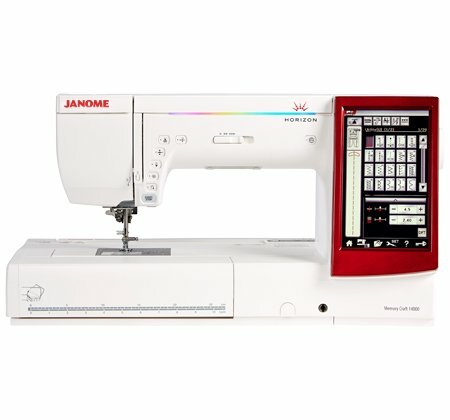 Features: Automatic thread tension, Automatic needle threader, AcuGuide cloth guide, Snap-on presser feet, Memorized needle Up/Down, Automatic presser foot lift, One-step needle plate conversion, AcuFeed Flex Layered Fabric Feeding System, 7 Piece Feed Dog, Stitch Composer Stitch Creation Program, Free Arm, Drop Feed, Variable ZigZag for Free Motion quilting with width adjustment for Satin stitch, Start/Stop button, Speed Control slider, Locking stitch button, Automatic thread cutter with memory function, Twin needle guard, Easy reverse button, Memory capability of 4 MB, Adjustable knee lift, Independent bobbin winder motor, Extra high presser foot lift, LCD full color touchscreen, Foot pressure adjustment, Maximum stitch width: 9mm, Maximum stitch length: 5mm, Sewing application support with on-screen help, Retractable HighLight and AcuView Magnifier in three different magnifications, 15" Embossed Stainless Steel Bed, Full intensity lighting system with 10 white LED lamps in 5 locations.